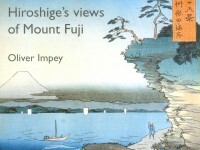 This booklet contains a selection of twenty woodblock prints illustrating views of Mount Fuji by Hiroshige. The first fourteen are from the series “The Thirty-six Views of Mount Fuji”, partly the work of his son-in-law Hiroshige II and published after his death in 1858. This was positively his last appearance, and, as might be expected, the interest of the designs vary in quality. Three others are from two different series of “Views of the Eastern Capital”, that is, of Edo, modern Tokyo, in which Fuji appears. These sets were made some fifteen years apart. A further print of a view of Fuji from Tokyo is from the set “One hundred Views of Edo” published immediately before his death. The last two prints are from the series “The Fifty-three Stations of the Tokaido Road”, the series which made Hiroshige’s name in the early 1830s, and which has made his name immortal. The Tokaido Road, of course, passes Mount Fuji on its way from Tokyo to Kyoto. The Views of Fuji series is rarely reproduced, and it has not proved possible to find any book in which they are all illustrated. Except for the chance to show the Museum’s holding of the prints from the Views of Fuji series, where an example of each image in the Museum’s collections is shown, the choice of prints has been purely personal, and follows no consistent theme, except the view of that loveliest of mountains, Mount Fuji. It is a matter of regret that the Museum is unable to show Japanese prints more often. The pigments used for these prints are exceedingly fugitive and are damaged by exposure to light; not just to ultra-violet light, but to all light. Thus they are seldom shown and only in low light intensities, as the damage is cumulative. The author would like to acknowledge the great help of Ms Watanabe Mitsuko, of Worcester College, in the preparation of this modest booklet.